It’s been a year since Hurricane Harvey changed many lives forever. The 2017 hurricane season was awful for people in Texas, Florida and Puerto Ric0. The hurricanes devastated people of all backgrounds and income levels. One year later, some hurricane victims are still out of their original homes and trying to rebuild their damaged homes, lives or move elsewhere. Hurricane Harvey, a category 4 hurricane, made landfall in the middle Texas Gulf coast on Friday, August 25, 2017 with 130 mph winds. After hitting land, Harvey’s winds decreased to 110 mph. The small town of Rockport, Texas was hit hard by Harvey’s torrential rain and powerful winds. Harvey’s drenching rains and winds pounded away at Houston and southeast Texas. The rainfall was too much for Houston’s bayous, reservoirs and drainage to handle. The National Weather Service says Harvey was a major storm from August 25-29, 2017. Harvey dumped 33 trillion gallons of water. George R. Brown Convention Center and NRG opened to shelter and serve thousands of Harvey flood victims who evacuated their homes from all over Harris County and other counties. 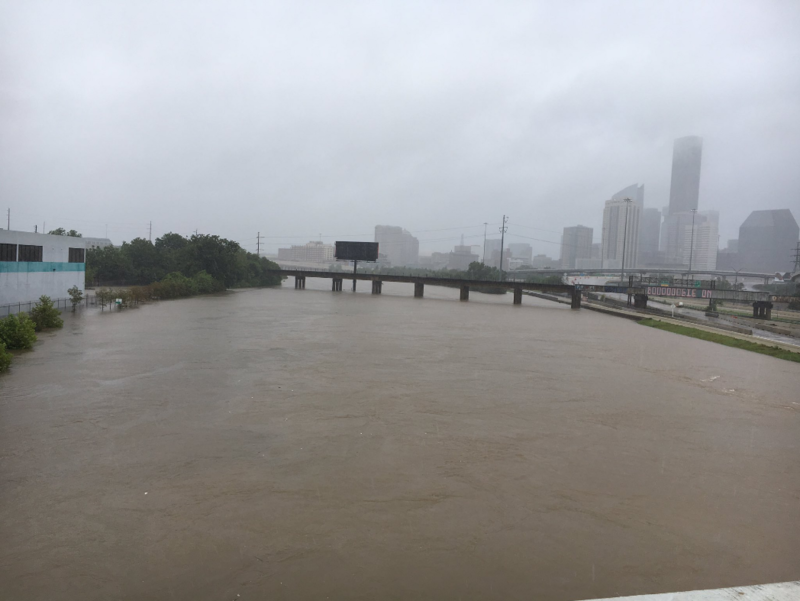 More than 40 inches of rain fell in the Houston area, according to the National Weather Service. Cedar Bayou near Baytown in east central Harris County received 51.88 inches of rain from Harvey. In the early Sunday morning hours of Harvey, veteran Houston Police officer Steve Perez on his way to work and 6 members of the Manuel Salvidar family were killed by the rising water. Some 29 people died during and after Harvey in the Houston area. Led by Houston Mayor Sylvester Turner and Harris County Judge Ed Emmett, first responders, volunteers, anyone who had a boat or high water rescue vehicle went to work to rescue those still trapped in their flooded homes. Continuous local news coverage and meteorologists’ updates were broadcast to those who had working televisions or through social media during the power and cable television outages across the city and county due to electrical or cable control systems in flooded building basements. Harris County Office of Emergency Management Meteorologist Jeff Lindner emerged as a calm voice during and after Harvey. Louisiana’s Cajun Navy, first responders from California and other states, faith-based groups, the Red Cross, churches and neighbors stepped up to help the Hurricane Harvey victims with food, shelter, clothing or money. Governor Greg Abbott declared a state of emergency before Tropical Depression Harvey developed into a hurricane in 40 hours. FEMA also set up recovery centers to handle claims and apply for federal money. The phrase “Houston Strong” was born. So many heroes, emerged to rescue others and raised money to help flooded out families and people recover. The Houston Astros won the World Series to lift Houston’s spirit. Texans J.J. Watt Foundation raised over $37 million to help Houstonians rebuild and recover. “Mattress Mack” Jim Mc Ingvale opened his Gallery Furniture stores to give Harvey families a place to sleep, rest and gave them food, clothing and what they needed most. Today, Houston is more resilient and stronger….still rebounding. On Saturday, Harris County voters approved $25 billion flood control bonds for projects to mitigate future storm flooding. Have faith and look forward, Houston. A look back at what Hurricane Harvey did in parts of Houston. This entry was posted in Asian Community, Houston News, Hurricane Harvey Recover, Hurricane Recovery, National News and tagged Hurricane Harvey One Year Anniversary. Bookmark the permalink.